Preheat oven to 375°F. In the bowl of a stand mixer, combine Gold Medal™ flour, brown sugar, baking soda and salt. Gradually add in butter and mix with paddle attachment until crumbly. In a small, separate bowl, whisk together buttermilk and egg. Pour into flour mixture and mix until just combined. The dough should be shaggy and a little wet, but not too much. If it's so wet that you can't hold it in your hands, add 1 tbsp flour at a time until it comes together. Do not knead. Fold in raisins, if desired. Shape dough into a round loaf and place in the center of a lightly greased cast-iron pan or a parchment paper-lined baking sheet. Cut a 1/4-inch deep cross on the top of the loaf. Bake 30-35 minutes or until golden brown (you may need to tent aluminum foil over the top of the loaf in the oven if it's browning too fast). When I was in fifth grade, I was assigned a project for St. Patrick’s Day. We could either build a diorama focusing on a historical aspect of the day, write a paper (yuck) or made a traditional Irish food. Being a foodie from a young age, I decided to make Irish Soda Bread. I was so excited – I’d never made any type of bread before, and I knew my classmates would eat my creation the next day in class! I baked the bread, wrapped it up and brought it to school the next day. It tasted terrible – dry, crumbly and completely flavorless. I was devastated, and vowed from then on I’d never make Irish Soda Bread again, let alone eat the stuff. But I was destined to be reunited with the infamous loaf – Tablespoon asked me to make an Irish Soda Bread and write about the process. Instead of saying, “No, way!” to the opportunity, I decided now was the time to reconcile with soda bread. Irish Soda Bread is a delicious, easy bread to make for your St. Patrick’s Day festivities, or just because. 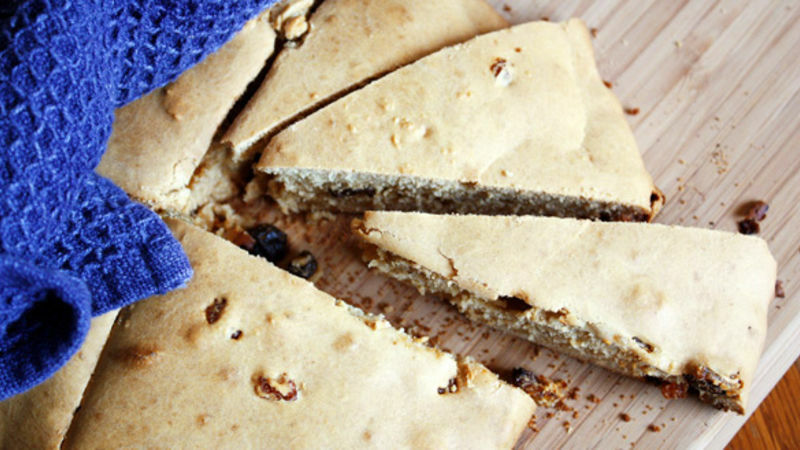 Made with buttermilk, sugar, raisins (if you want) and of course, baking soda (the star of the show), soda bread is a simple recipe, but its flavors all come together to make a mellow, delicious quick bread. Its consistency is that of a soft, yet still crumbly scone, and the inside is dense and moist. It’s perfect warm and straight from the oven and served with tea or coffee. Now that Irish Soda Bread and I have rekindled our friendship, I bet I’ll be making this easy-to-make bread a lot more often.